Mahindra has trademarked the name Alturas G4 for an upcoming SUV. 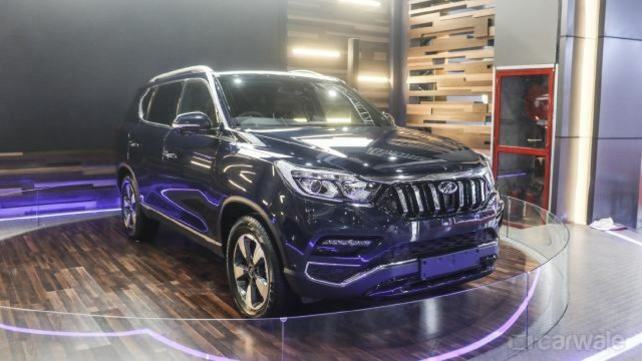 This name is likely to be used for the Y400 SUV which is the second generation Ssangyong Rexton that was showcased at the 2018 Auto Expo but with Mahindra badging. It’s a feature heavy vehicle with the likes of three rows of leather upholstery, touchscreen infotainment system with Apple CarPlay and Android Auto, power seats and climate control. Powering the Alturas is a 2.2-litre four-cylinder turbo diesel producing 185bhp/420Nm. This engine is being offered with a six-speed automatic and AWD. It’s expected to be offered only in one or two top-of-the-line models, so safety features include 9 airbags, ESP, hill descent control and hill start assist. This car is Mahindra’s competitor for the likes of the Toyota Fortuner and the Ford Endeavour. It will be locally assembled at Mahindra’s factory in Chakan and will be retailed through a separate premium section in the existing Mahindra showrooms. We expect that Mahindra will price the car in the range of Rs 28 lakhs to Rs 32 lakhs.